Saturday September 6th, 2008 from 9am-7pm at Maserati of Baltimore citizens head out to support our troops and joint the fun. All proceeds and donations will benefit the USO of Metropolitan Washington. Email us at mobexotics@gmail.com to make a pay at the gate reservation or to ask how you can participate or contribute in a way that will make our event more fun. REPUBLICANS, DEMOCRATS, AND INDEPENDENTS GET TO VOTE FOR CROWD FAVORITE AWARDS FOR “BEST OF SHOW FOR THE USO”. With many great press sources coming to participate and offer follow up event coverage, we have a FANTASTIC opportunity to really show support of our TROOP just by showing up. Not enough support from the exotic car community to host a Concorso style event and make it a success? BAH. CAR GUYS SUPPORT OUR TROOPS. REGARDLESS OF YOUR POLITICS, THINK OF MASERATI OF BALTIMORE LIKE SWITZERLAND (SOMEPLACE NEUTRAL FOR ALL AMERICANS). More details to be released next week, so check back right here at www.mobexotics.com often to follow up. The game might be on for Sunday with the Baltimore Ravens, but on Saturday at MOB EXOTICS, we plan to have this one won. September 6, 2008 at Maserati of Baltimore Rally for the Troops at the Exotic Car Show hosted by Maserati of Baltimore, Signature Flight Support, and Chapin Davis Investment Management Services--all Baltimore Washington Area Local Businesses helping to raise funds and spearhead troop moral for soldiers and their families who reside or pass through the Mid-Atlantic region. Proceeds are being donated in full to the USO of Metropolitan Washington (sponsor of the BWI USO Metro Lounge). Monitor here for details or learn more about the USO at http://www.usometro.org. Special thanks to Terrence Breschi of http://www.breschcraft.com for creating this amazing new Exotic Car Festival T-shirt Art template thanking sponsors, media sources, and volunteers for helping us arrange this new event as a USO benefit. 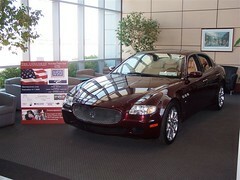 Friends and families of Maserati of Baltimore, M.O.B. Exotics, Lamborghini Baltimore, Maserati of Washington, Ferrari of Washington, and Lamborghini Washington take note! There is a wonderful opportunity coming up this fall to play in traffic with your exotic cars, have a great time, and to raise some money for a very worthy cause–benefiting our soldiers and heroes of the United States Armed Forces through the charitable efforts of the USO Metro non-profit organization. Saturday September 6th launching from the Maserati of Baltimore location at 1628 York Road in “Lutherville Timonium” [according to most Nav and GPS devices], we’ll be hosting a ROAD RALLY touring the northern Maryland regions and finishing with a touch of magic right back at home from Baltimore’s LITTLE ITALY. The exact course is being determined now, but drivers and co-pilots can expect to visit Maryland’s soaring heights and lush county grounds while they wind their way about the lakes and mountains, returning to the dealership landing spot to have a quick treat from downtown. Offering a fun rally style for everyone, we’ll be rewarding our most attentive teams with some terrific M.O.B. Exotics Race Fan Boutique certificates. On that same day, later that evening Saturday, September 6, speed and travel fans can head over to the Baltimore Washington Airport Signature Flight Support Terminal area to visit the next leg of the weekend events. Aptly titled, “Wings and Wheels”, participants will get an up close and personal look at all kinds of exotic cars, planes, military vehicles, and private jets. With great assistance from BWI and Signature Flight Support, crowds are sure to be “wowed”. Patrick Moylan, the Signature host, is the gentlemen to meet at this great show! On Sunday, September 7, 2008, the USO Metro Team will be following through again with a huge CONCORSO event hosted at the POWERPLANT LIVE, making Baltimore’s Inner Harbor an even better looking and sounding venue for car lovers to day or weekend trip for this event. With over 5,000 visitors already expected to attend, you will want to register early to be sure to get your Pit Passes and car placement for this event. As spectators ourselves for this event, we are anxious to see all the cars they have lined up to bring in from car clubs all over the Mid-Atlantic region. We are sure this will be a spectacular “brighter than fireworks” Baltimore event! Jonathan Kendall started [helping organize car show events] in October of 2005 as a way to raise money to help our community in the Baltimore-Washington area. The first event was attended by about (100) people, (12) cars and a beautiful automotive art display together in Annapolis. 2006 Followed a move to the famous City Dock in Annapolis, (100) people, (25) cars along with Jonathan’s beautiful photographic style of art. In 2007 the event took a huge leap to Little Italy in Baltimore where there were (75) cars and motorcycles, (250) ticket holders, (3000) spectators. This year Jonathan [and partner Dave Born] have chosen to work with the USO as the beneficiary. 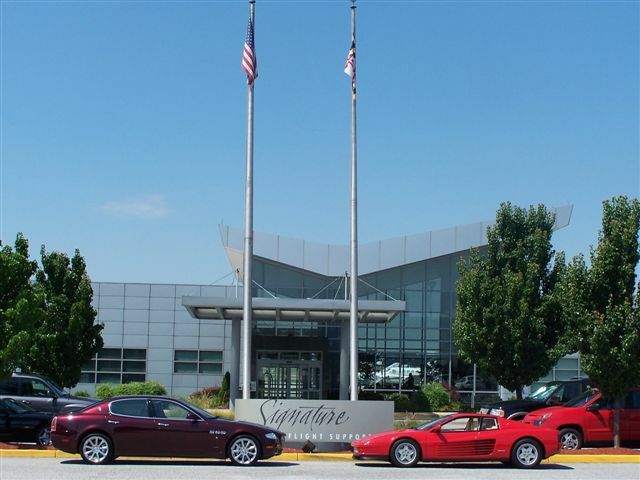 Saturday, September 6th starts with a fun “Rally” driving event through the Baltimore County, Maryland countryside… [from Maserati of Baltimore]. Saturday continues with the evening event at the Signature Flight Support “Wings and Wheels” Reception to be held at their modern BWI general aviation facility. Ticket holders will enjoy wonderful assortment of international cuisines, wine and drinks. There will be a silent and live auction to benefit the charities. And the event will feature live entertainment as well as a display of automotive and aircraft art. Sunday’s event is The Concorso and will be in downtown Baltimore at the Cordish Company’s exciting Power Plant Live located at Market Place and Water Street. Over (100) exotic cars will be on display for the general public to view. There will be a private lounge, Angel’s Rock Bar, where ticket holders will find food and drinks for the afternoon. This will be our formal car judging segment and also include live entertainment, auctions and art displays.